You are invited to join our ‘Small Ride’ on Saturday 3 May. Starting at 11am from the High Street in Sutton (by Trinity Square and Waterstones) we will be pedalling to Cheam Park and back, a round-trip of about three or four miles. 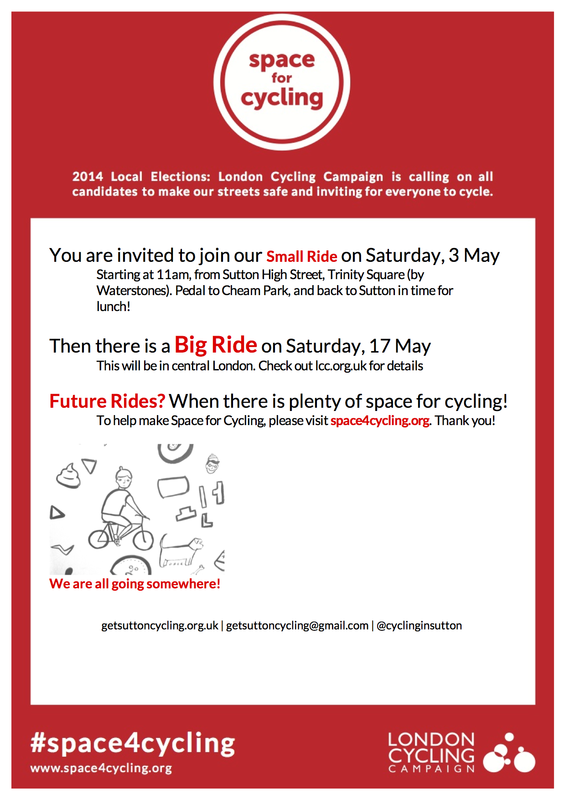 The ride, in support of Space for Cycling ahead of the forthcoming local council elections on 22 May, is to celebrate what will hopefully be the start of big thinking on cycling in Sutton. You don’t need lycra or a fancy bike, (but your bike does need to be in good working order of course), just come as you are and enjoy a short ride with mums, dads, brothers, sisters, grandparents and children. Meanwhile, you can help ensure that Space for Cycling is on the agenda of every candidate by simply heading over to space4cycling.org and putting in your postcode, pressing a few buttons and entering your name and e-mail address. Your action will send an e-mail to every candidate in the local election ward in which you live, asking them to support ideas that could start the process of bringing safe and comfortable cycling to a street near you sooner rather than later! Dr Bike mechanics will conveniently be in Sutton town centre on Wednesday from 4-7pm (right by where the small ride will start on Saturday), so you could take your bike along there first to have it checked out. 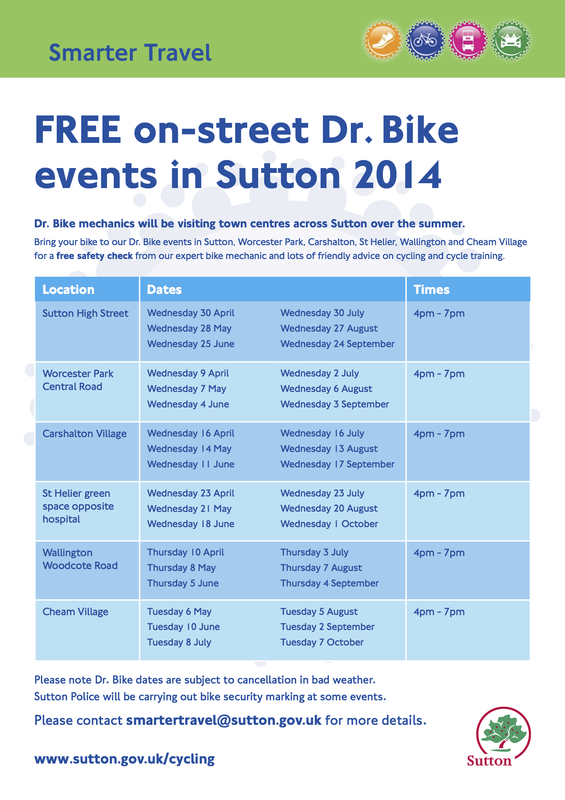 The poster below gives details of all the Dr Bike events across the borough this summer.